For artists who make things with their hands, their materials provide direct and immediate feedback: No hiding from the result. The lip of a vessel does not curve the way they thought it might. A new layer of paint moves an image from near perfect to overdeveloped. The materials themselves teach artists to work with what they have in front of them without distraction. They learn to create without the clutter of unnecessary thought. The art students I teach at Massachusetts College of Art and Design (MassArt) feel that this direct and honest practice is required when they write flash nonfiction. One student feels that this quality of honesty is best described as being transparent: “The shorter the writing, the fewer layers you have to hide behind. It can be daunting, but the simplicity is refreshing.” Just as in art, for this writing genre to succeed, meaning is reduced to its essence. Flash nonfiction gives art students a way to explore the core of their work through concision, prompting them to search for ideas by connecting the lines of thinking, making, and living. They begin with seemingly ordinary moments—gazing at one’s hands, drawing in a sketchbook, walking with friends in the mountains, traveling with Dad on an interstate highway—then integrate these progressive lines into flash pieces that reflect upon who they are as artists. At MassArt, we experiment with this literary art form in the annual gallery show Why I Write. Why I Create. On large 30”x 40” banners, students express in 350 words or less their process of creating. They then pair their written response with an image of their art. They journey through their imaginations to provide intimate portrayals of the courage it takes to deliver truths through art. Memories, words, and images begin to mingle. A new understanding unfolds from the ancient wisdom: The heart recognizes what the mind cannot know. When I ask art students what it feels like to write flash nonfiction, some say it is like sprinting. Words may come in short spurts. In sprinting, the runner eliminates unnecessary movements. In visual storytelling, it is essential to leave out any details that are not vital. An illustrator, for example, who wishes to tell a story in a single frame, synthesizes larger experiences in life with lines drawn to represent small moments. The skill of omission is key. In the classroom, we first study omission using John McPhee’s essay, “Omission: Choosing What to Leave Out,” in The New Yorker (2015) where he reflects on how he learned to consider what details to exclude to focus a story. Then we expand this discussion by considering unhelpful uses of the omission; that is, missing elements that keep artists from delivering truths through art. From the essay collection Creating Nonfiction: Twenty Essays and Interviews with the Writers, we study Cheryl Strayed’s observations on knowing, refusing to know, and the role of truth-telling in her essay “Kestral Avenue.” And we investigate the nature of implicit biases revealed by what is omitted in Faith Adiele’s essay “How to Make Sense of the Postcolonial Nation-State: A Definition Essay Using Material Lifted Almost Entirely from the Internet as Annotated by the Author, Herself a Nigerian American.” Understanding these many sides of omission strengthens art students’ ability to show unseen moments in unexpected ways. No discussion on omission is complete until we consider negative space—the shape of the empty space (or white space) once the first line is drawn on the page. In graphic essays, the white space between the panels serves to prolong the opening of the reader’s perception. In flash nonfiction, white space may be represented by breaks that leave room for the reader to imagine the larger context for the story. For example, the first sentence of an essay that invites the reader’s attention may be followed by a paragraph break. This break can highlight the shape of the next paragraph, a container designed to move the reader quickly into challenging material, such as the experience of a young person translating for her family as they navigate the complexities of U.S. culture. I am a translator who has found purpose through necessity. Translation is supposed to be an innocuous act, but every word becomes a bomb in a battlefield. I am aware of the lives I’m responsible for when I am appointed as both general and messenger of my consanguineous army. My body trembles with the incredible burden, and I predict only disaster. A slip of the tongue here, a missed phrase there, and a bill goes unpaid. A child warily awaits a pick-up that never happens. A diagnosis falls on illiterate ears. Each mistake is an eaten ration, is a lost friend, is a civilian death. Translation then becomes precise, it becomes surgery, and it becomes my family’s last line of defense. Thirteen years old, and my word is gospel. “What does it say?” my mother asks, her gaze blank on a school newsletter, a medical exam, an eviction notice. My tongue quivers and stumbles between one, two, one-and-a-half parlances with the clumsiness of a native. I translate the text, and in the spaces between I translate the burden of knowledge. I translate the anxiety between me and words, for words are frequential slurry seeping through my cortexial carpet. I stitch together the organic fragments of a language I call home through the galvanized steel of clinical palaver, and gurgle the disjointed syntax that results. Again, and again, and again. Twenty-four years old, and my word is practice. My repertoire expands. I translate the past to the present. I take in and translate the language of space—the space between objects, the space between words, the space between synapses. I translate the furious, ugly noise that you, and I, and we choose to drown out, and whisper it in silence. I translate blood and anguish with flowers and greeting cards. I translate with the knowledge that my translations can foster and destroy. I translate with the knowledge that there are many who wish to remain lost in translation. I revel in the knowledge that my translations are my most powerful apparatus. 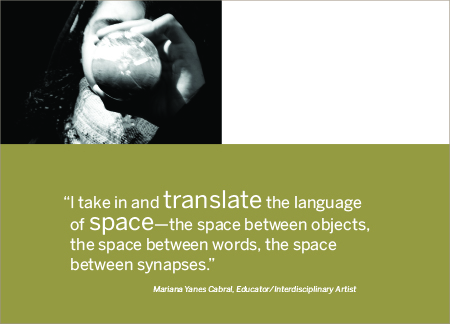 Mariana Yanes Cabral is an interdisciplinary artist and educator. Born in Rio de Janeiro, Brazil, and the eldest of three children in a multi-national household, the Brazilian-American artist lives and works in Boston. Cabral’s work explores nostalgia, introspection, race and politics with both traditional and digital media. Jeanette Luise Eberhardy, Ph.D., MFA, is a teacher, writer, and storyteller. Eberhardy serves as program coordinator, first year writing and assistant professor at Massachusetts College of Art and Design. At the 17th Annual Women’s International Conference in Berlin, Eberhardy gave the opening address Your Story Matters to 800 women business leaders. She has delivered her Storyforth seminars in Egypt, Sweden, Italy, Czechoslovakia, Germany, and the U.S. Eberhardy is working on the book Why I Write. Why I Create: Global art students show how they express themselves. She can be reached at WivInc.com. The linked John McPhee article says “Creative nonfiction is not making something up but making the most of what you have.” But first you have to have it. I miss the “how” in this article for I know no other way than to overwrite, put in everything and then to cut and tighten. It seems a wasteful way to write. As a poet who writes on art,I found value in this well written essay. It strikes me that Eberhardy provides an invaluable learning experience to her art students. She guides them through the process involved to express in language the essence of their important visual ideas. I would love to read more….. Professor Eberhardy offers a way for her students through flask non-fiction to connect their visual art making process with their writing. As I visual artist, I appreciate this line: “Just as in art, for this writing genre to succeed, meaning is reduced to its essence.” Cabral’s work at the end of the piece is also a beautiful and moving example of this method in practice. I read Professor Eberhardy’s article through the lens of a writer who was trained in a very traditional visual arts program. It made me wonder how my evolution as a writer and an artist might have been different had I experienced something like “Why I Write.” Thanks for sharing your story and for inspiring me to take a fresh look at how my two fields influence one another. I am a sculpture professor who also encourages students to consider how crossing media of any type contributes to the richness of a work of art. I, too, have used McPhee’s writing about HOW he works as a model to share. I found Jeanette Eberhardy’s description of the territory that she has defined so beautifully coupled with Mariana Yanes Cabral’s essay truly moving. A great example of fine education.